Hello Tuesday!!! Well... I will admit... I did absolutely NOTHING yesterday! No...that's not true... I did sew on my wool flower project...LOOK... Our background fabric is from the scrumptious collection "Little Gatherings" from Lisa Bongean - Primitive Gatherings. Our flowers are all from wool! Soon it will become a beautiful quilt that she has designed. 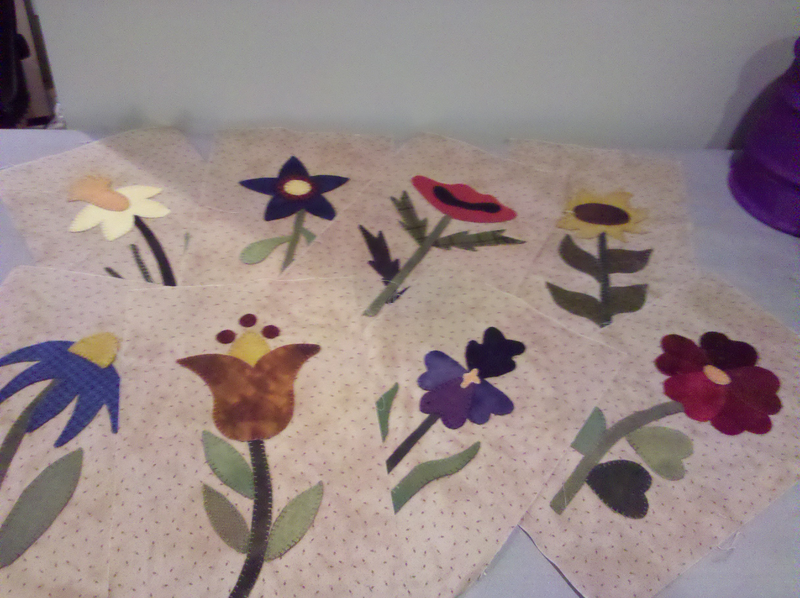 I'm working on this project for Cinnamon's Quilt Shoppe here in Jacksonville. Karen Covey, the owner, recently attended a week long retreat for shop owners at Primitive Gatherings. She came home all pumped up and excited with this awesome project! You'll learn more about it as the months progress! But if you are a wool lover, or if you've always wanted to try your hand working with wool... this is your project. Great for beginners!! My girlfriend, MerryAnne, is coming over later for our sewing day. She's such a kook...love her to death! She, Jack (DH) and I have the best time together. She's retired from the railroad (dispatcher) and enjoying her retirement as we are. We sew for several hours, laugh and have a blast. Have you seen my newest...bestest... friend? Here she is!! Her name is RUBY!!! HA... don't you think that's appropriate? 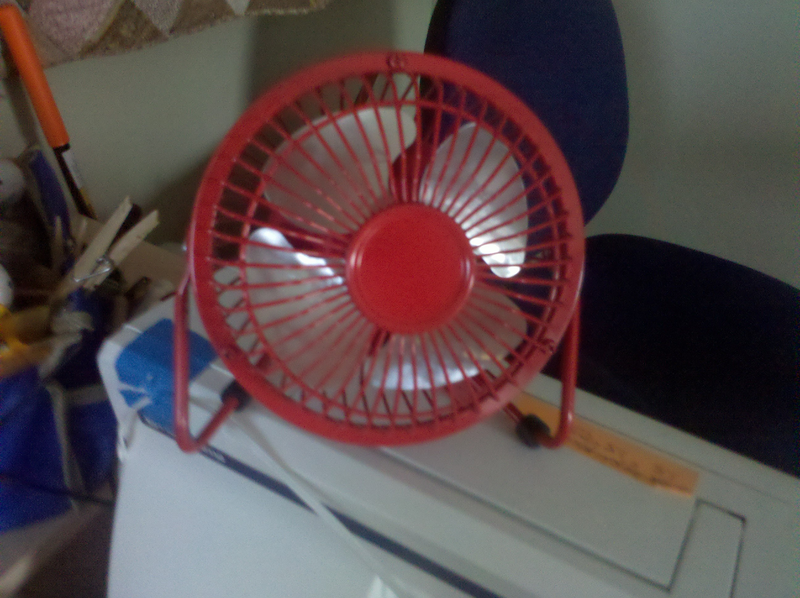 My little red fan and I go everywhere together when we are sewing! LOVE HER! It's amazing how much better my disposition is when she's with me running full force. I oh.. so.. hate.. to sweat! If you too would like a friend like mine... WALMART!! 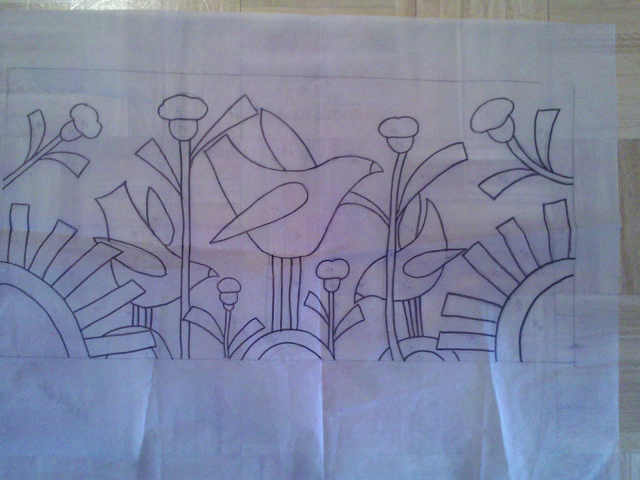 I'm also working on designing a wool applique project for on a jute bag! 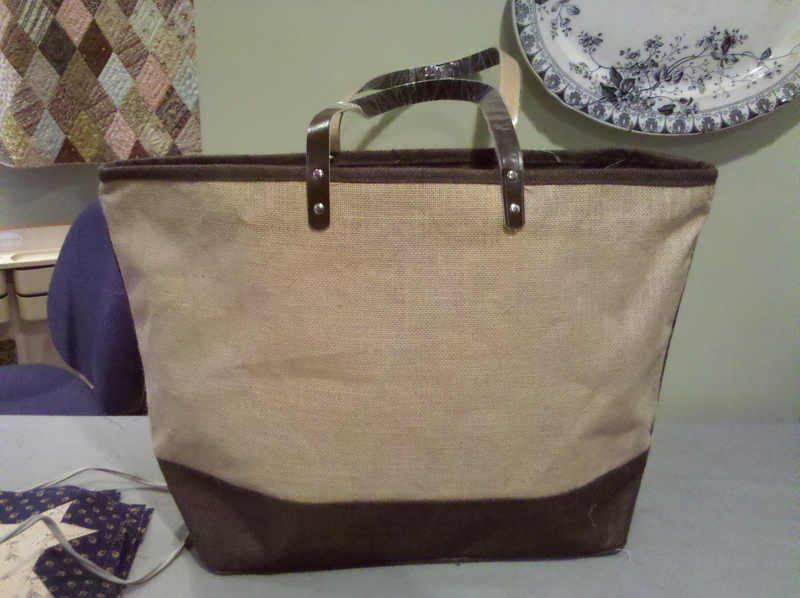 I found this super bag at Hobby Lobby and it's a perfect size for toting my projects back and forth from the house to Cinnamon's (quilt shop). Since it has a great background of the jute fabric (love the texture)... I'm thinking I might add some wool applique to the outside! Here's my design too... I can't wait to get started... of course.. there are many times that we start on a project and it just doesn't come out as our vision thought it would... so here's keeping my fingers crossed!! This week my honey, Jack, and I are leaving for Indiana!! I haven't been there in....let's see... way before 1976! We are visiting his younger sister and her family! Cousin Sylvia and her hubby are also joining the crew! They guys are going to a car show (Jimmie Dean car show???? ... never heard of it...) and the girls are going to every antique store we can!!! Now.. Linda (Jack's sister) and Sylvia are a riot!!! I simply can't wait to hang out with them. I know my sides and jaws will be aching from laughter! PLUS... I can't wait to see what scrumptious goodies I will find. They are in the antique capitol of the world!!! YEE HAW!!!!! I'll have to post photos of my treasures! Thursday we will take off... can't wait to get in the cooler weather... low 70's!! Now that's my kind of weather!! Today it's to the doctor (ugh) then a few errands then sewing... ! What a good life! Chat with you soon!! !.